UPDATED 5/15/18 12:57PM: For grammar and clarity. As a winter chill whipped through the streets of Boston on January 7, 2015, a transition was underway on Beacon Hill. Beneath the State House’s 217 year-old golden dome, for the first time in decades, a Western Massachusetts senator was taking over. As Stanley Rosenberg raised the gavel in triumph, little did he realize, looking down on him were the alpha and the omega of his 27-year senate career. He knew his former boss John Olver was in the gallery. Rosenberg filled Olver’s senate seat after the latter won a seat in Congress in 1991. Seated next to Olver was Bryon Hefner, later Rosenberg’s spouse. Hefner’s care and affection would transform Rosenberg’s life, but also prompt destruction. This past Friday Rosenberg resigned from the Massachusetts Senate amid pressure from colleagues. It came days after a scathing Ethics Committee report said he had failed to protect the Senate from Hefner’s behavior that included overstating his influence and allegations of sexual assault. His presidency had ended five months before after The Boston Globe reported Hefner’s actions. A leave for the duration of the subsequent investigation became permanent after news broke Rosenberg had given Hefner access his official senate email. Rosenberg’s assent and ultimate fall is almost literary. He came to Amherst for college, fleeing a neglected background as a foster child, only to return to Boston as state senator. The day he became president, characters who would play later roles in the ensuing drama filled the Senate chamber. Rosenberg’s presidential successor, Harriette Chandler, nominated him for president. Three of four senators who called for Rosenberg’s exit from the Senate were there. 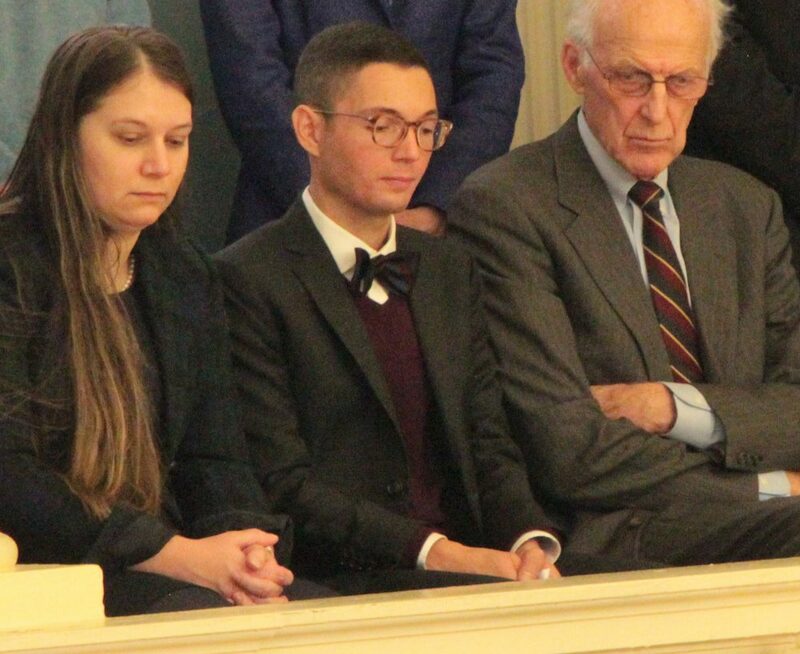 Even Northampton Mayor David Narkewicz, now playing a role in the process to fill Rosenberg’s seat, was up in the gallery. The protagonist, a wonky progressive, ascended to the highest levels of state government unsullied by the veniality that often cakes Massachusetts politics—only to be felled by love. This is not to excuse Rosenberg. Though the Senate report all but cleared him of knowing about Hefner’s allegedly assaultive actions, it was not free pass. In catering to Hefner, Rosenberg violated legislative IT policy, failed to enforce the Senate’s sexual harassment policy, and perhaps more significantly, he lost the trust of his colleagues. Constituents in his brainy, college-packed district felt sorry for him, but also see how it went wrong. “Stan made one bad decision in getting involved with this deeply troubled young man and it just turned out to be disaster,” Ellen Story, Amherst’s former state rep, told Northeastern Public Radio. “There is huge affection for him among his constituents in his district,” she continued. Indeed, even after the Ethics report, Rosenberg could have prevailed over his sole primary opponent, Chelsea Kline. She will now be the sole candidate on the September 4 primary ballot—of any party—absent legislative intercession. Rosenberg felt betrayed by his colleagues, but they felt the same way toward him. Following a story that Hefner was mouthing off about his power, Rosenberg promised senators a firewall between the Senate and Hefner. They got Saran wrap, while Hefner still had—or at least the appearance of—considerable access to Beacon Hill, including the senator’s email account, staffers, and lobbyists. Simon Van Zuylen-Wood’s portrait of Rosenberg’s fall in Boston magazine paints Hefner as out of control. They met when Hefner, 30, was interning at Rosenberg’s office. Despite the 38-year age gap, they bonded over a shared experience in foster care. Hefner encouraged the senator to live his life as openly gay and nurse Rosenberg back to health from a bout with cancer. But there was a dark side, too. While it is unclear whether Hefner had any direct influence on the Senate, he laid chaos upon Beacon Hill. At best, he was a boisterous, vulgar nuisance and at worst he disrupted and upended the lives of those who work for and with the Senate President’s office. That’s all before the allegation of sexual assault, lewdness, and nonconsensual photography (and distribution) for which he faces trial next year. Ironies abound. The men who told The Globe about Hefner’s harassment asked for anonymity fearing the impact on their careers. As David Bernstein, writing for WGBH, outlined in startling detail, such concerns were justified in Beacon Hill denizens. Yet, Rosenberg an uncorrupt, good-government type, was unlikely to retaliate. A legacy of not always living up to its ideals. Yet, Rosenberg followed another state political move: denial. Not denial as in denying the facts in Trumpian fashion, but a state of denial. Arguably, the same could apply to many in the Senate and State House, which took years to finally out Hefner’s behavior. As the #Metoo movement has laid bare, the culture of silence is not unique to politics. However, there was an expediency in clamming up as clearly so many did. Why make trouble when you can appear to get along and watch your approval ratings soar? As a political figure who soaked up the minutiae of policy, Rosenberg’s focus was the work and the details. Aside from broad policy concerns, he also championed his alma mater, UMass-Amherst. Rosenberg had enough savvy to navigate political minefields. In 2011, he handled the loss of a Western Mass congressional seat ably, perhaps better aligning the maps in the process. He repeated that performance with the casino bill later that year. This deft touch probably helped him overcome Stephen Brewer in the fight to succeed Murray. But this political success only reflected Rosenberg’s policy erudition. Rosenberg’s shared leadership, diffusing power among Democrats won plaudits, but his command of raw politics may have been lacking. Rosenberg failed to comprehend the severity of the problem Hefner presented and how the actions taken were woefully inadequate. “Stan’s conscience was the ultimate firewall,” a confidante of Rosenberg’s told Boston magazine. Likely no senator imagined this was the promised barrier. However, the dream of a Senate-led progressive policy push fizzled. There were some legislative achievements on opiates, ride-sharing, and criminal justice. Yet, Rosenberg’s Senate proved barely able to hold the line against a conservative governor and a House protecting its members from tough votes. Rosenberg may have legitimately found Charlie Baker swell—and maybe he is. His overly cordial gubernatorial critiques left progressive policy proponents wincing. Meanwhile (groundless) fears about Baker’s down ballot impact only grew. Politics is littered with figures who wrote their own careers’ death certificates. Many fall due to hubris and paranoia like Richard Nixon. Whatever his faults and dirty tricks, he was the author of a tragic fall worthy of antiquity. That is not Rosenberg’s story, however. His fits no single genre. He reached out toward a shining beacon and seemed to reach it. Yet, in fact it eluded him. Or maybe his star-crossed love was simply fated to do him in. It seems noteworthy that one legacy of Rosenberg’s that will endure is the shared leadership. Incoming Senate President Karen Spilka has assured as much. With it, though comes some collective responsibility. Shortly after Rosenberg’s resignation became public, the Senate made its own statement and formally apologized to Hefner’s victims. It was an acknowledgement Rosenberg alone was not responsible for the malignancy in their midst. The Senate, together, was ready to turn the page.